The most common questions I get are to do with getting faster on the rugby field and improving speed in the 100m (so can be faster on the rugby field). To give an appropriate answer is not easy over an email, in a short conversation or even one training session on the track. So I have designed a programme to do just that. It covers all bases from the person who has just 5 minutes free a day to train at home to those in pre season who can dedicate everything they have to getting faster. Sprinting itself is comprised of five different motions. Lifting the knee, bringing the foot through and under the body, extending the knee, extending the leg backwards and then hitting the ground. If you have muscle weaknesses in any of these components you are weaker. These can all be strengthened at home with some very simple exercises that you would not have done before yet will take time off your 100m very quickly. Without even improving one element of fitness you can make a difference by arriving on the rugby field at your own full speed capacity. These drills fire up your nervous system so you are as fast as you can be when you play. Most people are losing a lot of time because their running technique is poor to awful. It doesn’t matter how fit, fast or strong you are if every time you move your technique slows you down. Traditional running advice is awful, in this plan i cut through to the essentials. The more speed strength you have the faster you will speed around your opposition. These exercise will directly improve your power and on field speed. If you have time for these sessions you will be able to rapidly develop and utilize the benefits of all of the above methods through dedicated sprint sessions. All of the above methods have been tied together with different plans. The simplest of plans is just 5 minutes a day and a few minutes before each rugby session. The complete plan is for those who want to dedicate their whole training to getting faster. Even on the simplest of plans I would be shocked if you didn’t take at least 0.5 second off your 100m. That may not sound like much but it is the difference being tackled and escaping the defender, the difference between knocking on the ball stretching to catch it and it hitting you comfortably in the hands. In touch rugby you only need to be about half a metre faster to be breaking those finger tip tackles. If you do the complete plan then losing 1 second off your time is modest to say the least and 3-4 second shifts very possible. Some of my clients have started at prop and finished at outside centre following this type of plan. The programme comes in Pdf format with photos of all the exercises. 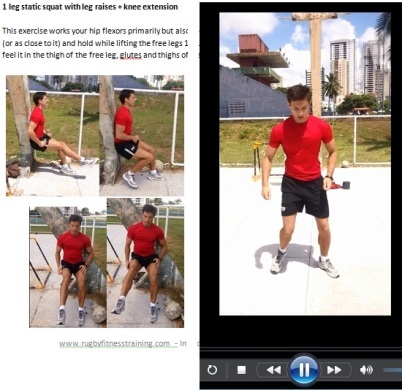 The plan is alsso accompnied by video emonstrations of the exercises involved. I will also send you an email when next at the computer (usually within 24 hours of purchase). Please ensure your given email is correct and check your junk mail folders. If you have not received anything from me within 24 hours please drop me an email.